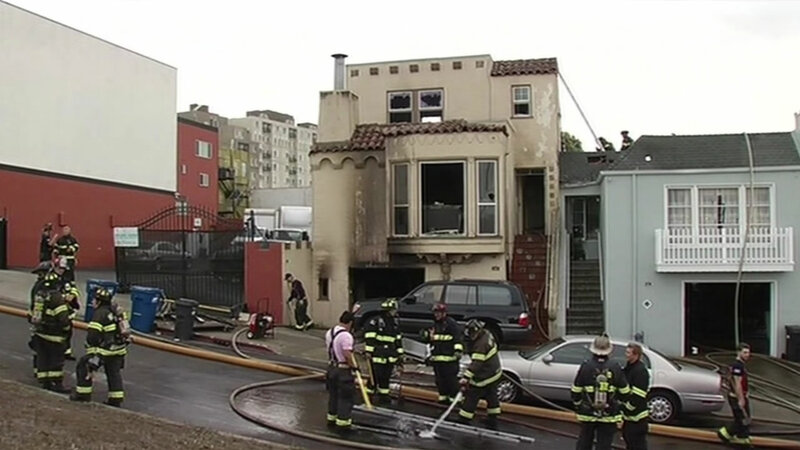 DALY CITY, Calif. (KGO) -- Five people were displaced and two firefighters were injured when a fire damaged two residential buildings in Daly City this morning, according to the North County Fire Authority. Around 5:40 a.m., firefighters responded to a three-alarm structure fire happening at a three-story building located at 33 Knowles Ave., according to fire officials. When firefighters arrived, they observed heavy smoke coming from the all floors of the residence, fire officials said. Firefighters entered the residence to search for occupants, but determined all residents had safely evacuated before firefighters arrived. As firefighters continued to the put out the fire, the flames traveled up and into the building's third-story attic. The fire also spread into an adjoining two-story residential building, according to fire officials. By about 7:40 a.m., firefighters were able to contain the blaze, fire officials said. Firefighters remained on scene after that to make sure the fire didn't extend and to complete overhaul and mop-up operations, fire officials said. No civilians were injured as a result of the fire, but two firefighters were taken to a hospital for evaluation, according to fire officials. The five displaced residents from the two damaged buildings were able to make arrangements for temporary housing, fire officials said. The cause of the fire remains under investigation, according to fire officials. The North County Fire Authority serves the cities of Brisbane, Daly City and Pacifica.